Note: Specifications quoted for 35µm (1oz) copper and 1.6mm substrate thickness. Where the finished copper is > 1oz, the minimum track width and clearance must be increased by 6 thou to ensure tracks are not etched off the panel during the production process. Note: Smaller internal cores and prepreg are available at additional charge. B.E.C. can reliably manufacture up to 10 layer FR4 circuit boards at competitive prices. We also offer mixed board multilayer panels to ensure your prototyping costs are kept to a minimum. B.E.C. can manufacture buried via/blind via circuit boards with capabilities to produce 4 thou (0.1mm) track and space. To compliment B.E.C. services all multilayer circuit boards are 100% bare board tested to ensure your assembly and test is trouble free. For further information please contact our Sales Team. B.E.C. 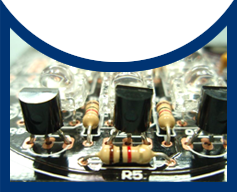 can manufacture circuit boards using FR4 as the standard material which is available in various thicknesses. Other materials available for use include Teflon. All materials are readily available and our Sales Team would be happy to assist you with your enquiry. Multilayer substrate is constructed using either 0.1mm or 0.2mm pre-preg FR4 and can be constructed to manufacture any thickness board you require. B.E.C. uses stainless steel to manufacture chemical etch solder stencils. These can also be mounted in the frame size you require. For all stencil pricing please contact our Sales team. If you have something that is not listed in our capabilities, please contact our R&D Department.